One of my favorite naturally non-caffeinated Arbor Teas is their organic Honeybush. Steeping the leaves, stems, and flowers of this plant indigenous to South Africa yields a sweet, light and woody infusion. It is enjoyable both hot and iced, and makes quite a pleasant transition beverage when you are ready to stop drinking caffeine for the day. Here honeybush is used to flavor a jelly. Its woody sweetness balances the tartness of the homemade apple pectin used to thicken the jelly. Really any loose leaf tea could be substituted in this recipe, but I chose honeybush for the kids! Honeybush tea jelly makes fantastic PB&J sandwiches. I've also combined the jelly with nuts and spices and stuffed the mixture into apple dumplings. Its sweet tart flavor is fairly versatile and broadly appealing to all sorts. Steep the tea leaves in the boiling water for 5 minutes, then pour through a fine-mesh sieve into a 6-8 quart pan. Add the pectin stock, lemon juice, and sugar to the pan. Bring to a boil over high heat and cook for 25-30 minutes, stirring occasionally to prevent scorching, until the jelly registers 220°F on a candy thermometer. Ladle the jelly into sterilized canning jars and process for storage using whichever method you prefer best. Cut the apples into 8 sections. Discard the stems only. Peels, core, seeds and remaining fruit all contain valuable pectin. Place the apple sections in a 6-8 quart pan. Add 6 cups of water. Cover the pan and bring to a boil over high heat. Boil until the apples have broken down and the peels separate from the pulp. This should take 30-40 minutes. Stir occasionally to prevent apples at the bottom of the pot from scorching. Set a large mesh sieve over a deep bowl. Pour the cooked apples and juice into the sieve and let drain for at least half an hour, until you have about 5½ cups juice. Stir occasionally, to dislodge the pulp at the bottom of the sieve and allow proper draining, but do not press down too hard so as to push the pulp through the sieve. Once strained, the pulp can be passed though a food mill to remove seeds and skins. This yields a very tart applesauce that can be eaten straight out of hand (sweetened and spiced at will) or incorporated into another recipe. Bring the 5½ cups juice to a boil over high heat and cook until reduced to about 3 cups. This should take about 20 minutes. 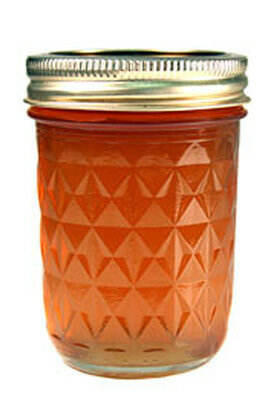 Refrigerate pectin stock, up to 2 weeks, until ready to use, or freeze for several months.